Young Gifted and Black: What Would you Do if you found this in your Bathroom?!!!!! What Would you Do if you found this in your Bathroom?!!!!! Omgee..I do not think I'd ever be able to use my toilet again without having panic attacks. This story is bewildering to say the least..How do you not see something this big, crawl into your home? A 12-foot python has been returned to its owner after a slithery stop at a Central Texas home where a woman earlier bathed her pet guinea pigs. 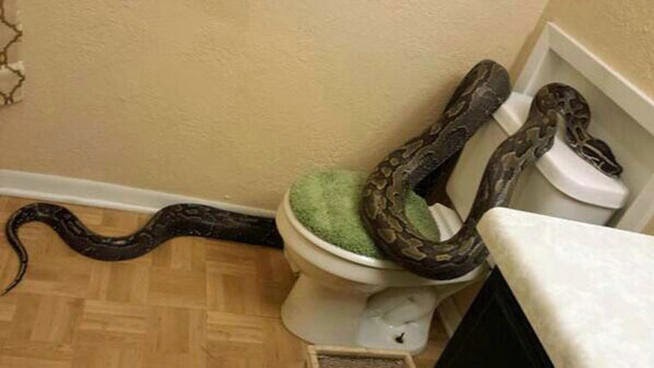 The Eagle newspaper reported Tuesday that Veronica Rodriguez was shocked in early May when the big snake turned up in her bathroom. Police believe the African python slipped into the house when Rodriguez left the back door open after bathing her three household guinea pigs and putting the critters in outdoor pens. Rodriguez says she heard strange noises, returned to the bathroom and discovered the snake crawling into the tub. She called 911. Hell No I would have to Move ASAP!